Are you looking for a nice gas patio heater so you can stay outside when the weather gets colder? Within our large assortment you will find patio heaters in all shapes and sizes. The advantage of gasheaters, is that you can place it everywhere. Whether it is on the balcony, in the garden or on the terrace: the gasheater always works. After all, you do not need electricity! Want to buy patio heating on gas? The gas used for the gas heater is butane-/propane gas and is available in many places. It’s very easy to replace the gas cylinders yourself. A major advantage of gas patio heaters is that they are portable because they do not depend on electricity. Gas patio heating is thus perfect for a garden with several seating areas or in places where no electricity is laid out. Gas heaters are also available in many variants. Hanging on the wall or standing on a terrace such as the Lounge heater or the Flame heater. One of the best known models is perhaps the "mushroom". This gas theater is sold a lot. You will encounter this user-friendly heater both on the horeca terrace and at home people. At the time of the communion parties and the examination parties much use is made of a hot air canon on gas. The party tent can be heated with great pleasure. And last but not least, it's a good idea to also name the Faber Dimplex The Buzz. You will undoubtedly know this gas on the outside of the many restaurants, but is also sold for use in your own garden. The Dimplex The Buzz is characterized by its glass panes around the atmospheric fire. This makes the use safe. 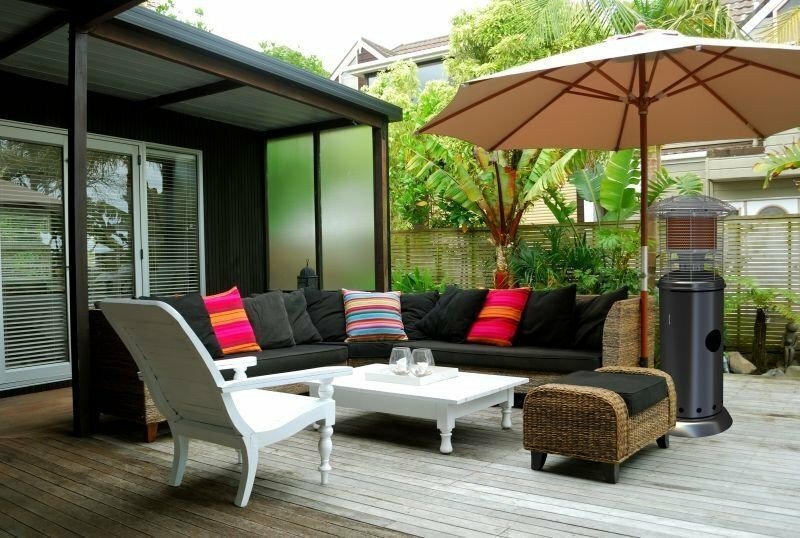 Moreover, it gives this patio heater on gas a stylish appearance. A variant of this outdoor fireplace is the Sunwood Marino outdoor fireplace. If you prefer a rust look, the Faber Dimplex The Buzz Corten is probably exactly what you are looking for. Would you like to enjoy your garden for as long as possible, too, even in late autumn? Then check out Firepit-online.com’s full range of patio heaters now. Firepit-online.com offers a wide range of patio heaters on gas. We sell the top brands Eurom, Solamagic, Outtrade and Schwank. And please don’t worry about getting the patio heater to your garden: usually your order is shipped the same day if ordered before 17.00hrs.